Breastfeeding Trauma – what makes it ‘traumatic’? I was lucky enough to meet Professor Amy Brown of Swansea University recently. She has been looking at women’s traumatic experiences of breastfeeding. I’m sharing some of her findings here, because like her, I want to highlight that this is quite a big issue that needs raising. As part of her research, she spoke to 2,224 mums who were left with negative feelings about not having been able to breastfeed for as long as they had wanted. That’s a large sample. The breadth of feelings that the women described was also large. Here is a selection of them for you to see. Notice, that “traumatised” is on there. Notice also, that none of the feelings are mutually exclusive. That is to say, one woman could feel one of these feelings, or she could feel ALL of them. She could feel defeated at the same time as feeling shocked. Also, it could be that one feeling is directly related to another feeling. For example, she could feel angry because she feels robbed. Or she could feel ashamed because she feels exhausted. It has become common parlance to refer to something as traumatic in order to convey how awful it was. However, in the model that we use for the Rewind method, we use the word traumatising slightly differently. When something becomes traumatic memory, it does so because the feeling stays with us long after it is functional, or logical. So, for example, it might have been awful when I got bitten by a dog, but I am okay now. I can walk past dogs and feel safe enough. Or I can talk about it without it coming flooding back. That suggests that the memory has been processed and is not a traumatic memory. However, if, after being bitten by a dog, when I avoid going to a park, or I become upset when describing what happened, or I completely avoid ever talking about it, then, we can say that the memory has been laid down as a traumatic one. The theory is that the memory has been laid down emotionally (in the amygdala), rather than in the long-term memory bank. Traditionally, people have thought that trauma (in particular, Post Traumatic Stress Disorder) is associated with overwhelming FEAR. However, that view is changing. We are now becoming aware that the feeling which comes flooding back does not have to be fear. It can be ANY FEELING AT ALL THAT FELT AWFUL. 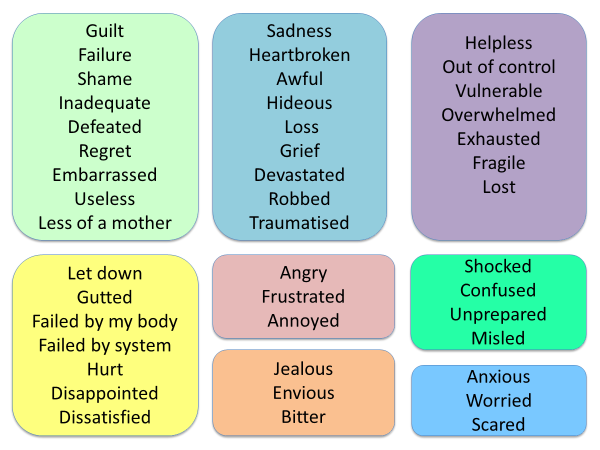 So, if you look again at the list of feelings which women describe, any one of those can be laid down traumatically. You can have traumatic memories of feeling despair. Traumatic memories of feeling fragile. Traumatic memories of feeling bitter. And so on. In Dr. Brown’s groundbreaking work, she records the women’s experiences in their own words. An example of how a feeling can carry on affecting you long after the event is over, is given by this mother “when I read articles that go on about how great breastfeeding is I’m right back in those awful, dark days with him screaming for hours and hours a day”. An example of how the trauma can play out in how you behave is given here “my best friend had a baby and it was so difficult to go see her. I am utterly ashamed that I did what I could to avoid her when she was breastfeeding”. An example of how the memory can carry on affecting you long after it is functional is here “ I have lost friendships over arguments with breastfeeding. I see red and can’t help myself and find myself calling them awful things. I know it’s because I’m hurting but I can’t seem to stop myself pressing the destruct button and making things even worse than they already are”. Thus, if it plays out when you don’t want it to, against your will, that is when we would consider it a “traumatic memory”. And when you start to think of it in this way, you begin to see just how common a problem breastfeeding trauma is. If I am wanting to help some-one move on from these distressing memories, I use the 3 step Rewind method. It helps if the person has an idea of the feeling that they want to release. They don’t necessarily need to be able to label it verbally, but they do need to be aware of the feeling that they want to let go of, or process, or unhook. In the case of breastfeeding trauma, it could be any of those feelings that were named by the women in Amy Brown’s research. If you find yourself working with women who remain overwhelmed with distressing memories of breastfeeding, and who find it hard to talk about it, or it continues to affect them long after the original problem ceased, and you aren’t sure how to help, you might it really helpful to be able to take them through the 3 step Rewind process. It’s a simple method which is proving to be incredibly useful in the birthing world, and I feel so glad to be able to spread this wonderful way of helping people to move on from breastfeeding trauma. We've evolved The MAM 3 Step Rewind Method with a commitment to safety for your client. After doing our course you'll have the skills and confidence to teach your client the process and guide her (or him) through it.